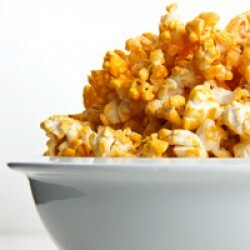 In a large, heavy pot, combine 3 tablespoons vegetable oil and ½ cup popcorn kernels. Cover and cook over high heat, shaking the pot often, until the popping stops, 3 to 5 minutes. Add the melted butter and toss.Dump the popcorn into a large paper bag and toss with the cheese and pepper.